Early in the 1400s, the french King Charles VI’s mental illness (a not uncommon occurrence in European monarchs) has placed the kingdom of France in a precarious position with regard to regal authority. The king’s brother, Louis, Duke of Orleans, an arrogant and avaricious bonne-vivant (as much corrupt as debauched), vies with a number of well-titled noble uncles for clout in the French court. On a cold November night, the duke is ambushed and savagely murdered in a Parisian street (with a long name which the reader will have memorized by Chapter 4). When looking for royal scandals, the modern age, whilst severely thinned of the ranks of pedigreed sovereigns (it’s anyone’s guess how many remaining today actually have noble blood and not many are giving up their DNA for analysis), does not have an exclusive hold. In fact, the royal scandals of the late 20th century have been relatively tame in comparison to the past (e.g. Bertie’s Second Throne). 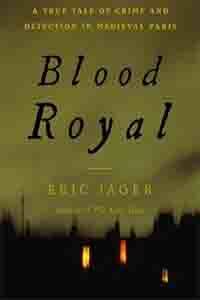 Eric Jager’s well-penned summation of a 15th century royal assassination scandal is a truly engrossing work of crime non-fiction. In fact, one might feel strongly that the text is in reality a captivating piece of historical detective fiction–especially in the middle chapters–were it not for the many citations. However, crime fiction is not the only perk in this enticing work. The reader is treated to a feel for high middle age life in Paris as well as a different perspective to the events and atmosphere that lead up to the famous battle of Agincourt; a battle known almost exclusively from the English side. The account of the investigation include details of the lives of middle- and lower-class commonplace activities and objects, as opposed to only those of the very wealthy or royalty. The criminal mystery is an ingenious “hook” for relating historical detail. Jager employs a 15th-century primary-source parchment report of the crime investigated by a knight and provost of Paris, Guillaume of Tignonville. However, in an age of “scholastic” fallacy-ridden rhetoric and general acceptance of witchcraft, satan-worship and post-mortem bleeding miracles, a very skeptical filter would be recommended when considering anything set down during this time period. Besides the superstitious influences on the culture and the investigation, other difficulties of relying on accounts of the time include the very conflicting and complicated symptoms of Charles VI’s illness and differing accounts of the Bal des Ardents. A few themes found within this story well within the understanding of modern readers include corruption, abuse of power, injustice and revenge. If you enjoy historical non-fiction, you are in for a treat. The book is concise, but well researched, and the reader is actually likely to enjoy the details found in the voluminous footnotes (sadly now found at the back of the book in modern times rather than nestled conveniently at the bottoms of pages, as in times past). My only real complaint with this book is the need for editing, as there is some repetition, particularly street names (one mentioned above), which could be improved by greater use of ellipsis.